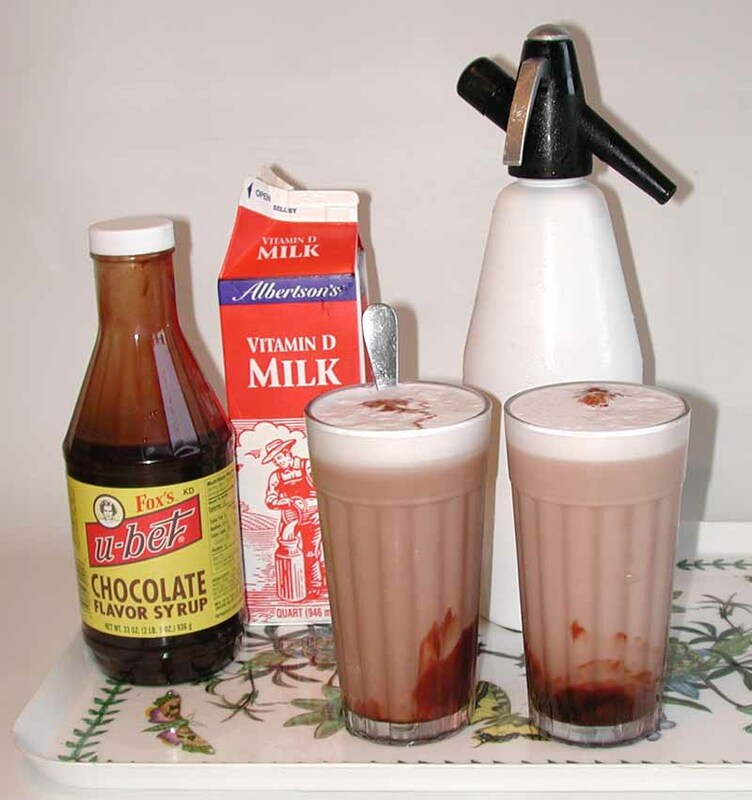 The Chocolate Egg Cream (which, as you probably know, contains neither eggs nor cream) is considered by many to be the most delicious fountain drink ever created. Born and raised in New York City, I can attest to the fact that the real egg cream is all but extinct. You can get something called an "egg cream" in some places today, but chances are it just isn't the same. You can find a lot of recipes, but they nearly always neglect important details. As simple as the recipe is, only by understanding the subtle details can one end up with the perfect, authentic result. The most important thing about making a REAL egg cream is using the right ingredients! It's not that easy to get started making the perfect egg cream, but I've done it and you can too. The seltzer is the first hard part. You can't just use a bottle of club soda, it doesn't squirt out under high pressure, and that pressure is needed to make the creamy froth that tops every good egg cream. It doesn't taste right, either. In the old days, seltzer was readily available in siphon bottles. We'd have them delivered weekly to our homes by the soda man, who would pick up the empties for refilling. Today, you'll need to start by investing in a seltzer siphon, the kind that uses CO2 cartridges. A good cookware outlet will be able to provide this, or do a web search, it won't be hard to find. One good source is Prairie Moon, another is Cooking.com. Unless you really love your local tap water, make your seltzer with filtered or bottled water. Next you'll need the right chocolate syrup, the thin kind. "Fox's U-Bet" works well, and is not that hard to find. This is one area where you can experiment, other chocolate syrups may work well. They should be thin and pour-able, like the kind the soda fountains used to use. If you need to spoon the syrup into the glass, it's too thick and it is not likely to make a real egg cream - no matter what you do. Okay, all that's left is a tall glass (12 to 16 ounces is fine), a long spoon, and whole milk. Don't use anything but whole milk if you want to call it a real egg cream, this beverage comes from an era when men were men and milk was milk. The second most important thing about making a REAL egg cream is the ORDER of adding the components! 1. Put about 1-1/2 to 2 inches of ice-cold whole MILK into the glass and put the SPOON in. (I will concede that you may put the spoon in first if you want). 2. Squirt the ice-cold SELTZER in, using as much pressure as you can but the thinnest stream possible. This generates the creamy white foam without blowing it all over the place—a mistake here could be disastrous, and so messy that you might require commercial cleaning! Fill it until the foam is 1 inch below the top of the glass. Done right, the foam should be creamy and snow white, with a distinctive bumpy texture. This might take practice. The seltzer spigots in the old-time soda fountains had two positions. When the handle was pulled forward, the seltzer came out in a thick stream under low pressure. When it was pushed back, it squirted out a thin stream under high pressure, allowing the soda jerk to create a foamy head. 3. Pour the chocolate SYRUP through the center of the white foam, until the foam rises to just above the rim of the glass. 4. MIX the drink with the spoon, keeping the bowl of the spoon at the bottom of the glass, then remove the spoon. If you do it this way you will have it - a REAL NYC Egg Cream that looks and tastes the same as the one that made itself famous years ago. It will be comprised of delicious chocolate carbonated soda on the bottom, topped with an equally delicious head of pure white foam, and there will be that tell-tale spot of chocolate in the center of the foam where the syrup was poured through at the end. IF THE LITTLE CHOCOLATE DRIP ON TOP ISN'T THERE, PLEASE DON'T CALL IT A REAL NEW YORK CITY EGG CREAM!!! AND... IF THE FOAM IS BROWN... FUHGEDDABOUDIT!!! VARIATION: If you get some good vanilla syrup, you can use the same technique to make vanilla egg creams. The vanilla egg cream was never as common as the chocolate, but some people think that it's even more delicious. By the way, the usual NYC pronunciation was to say "eggcream" as if it were one word, with the accent on the first syllable. If you try this recipe, please do write me and let me know how it turned out. Update: This web page was cited in "American Way", the American Airlines in-flight magazine, in July 2002. The article compared "real" things to their lamentably commonplace imitations. It used the egg cream as one example, and cited this page as a source for the "real" one.